The new Slab Scalper designed and manufactured by MINO, is a state of the art Slab Scalping Machine using lubricant-free cutting technology which allows to maximize the chips recovery and reduce the pollution of the process. The equipment has been designed from scratch having in mind some key targets: effective chips containment system, easy access to the mechanical groups for maintenance, vibration free operation and long-lasting service life. The special features that have been incorporated in MINO’s design together with the use of heavy duty mechanics allow to achieve high productivity and superior surface/shape quality in the outcoming slabs, which are necessary preconditions for targeting good results in the subsequent hot rolling process. On November 2014, the Final Acceptance Test Certificate of MINO Four-High Roughing Mill and MINO Six-High Intermediate/Finishing Mill in Anhui Xinke New Materials Co., Ltd. has been signed. These two mills represent the state of the art of the technology of the cold rolling of copper and copper alloys strip. They are able, together, to process the overall thickness range from 17 mm down to 0,1 mm and to produce strips which comply with the strictest quality requirements of the market. The Four-High Roughing Mill and the Six-High Intermediate/Finishing Mill are equipped, respectively, with MINO AGC system and MINO AGC/AFC system and with the complete L1 and L2 systems. During final acceptance test, the performance of the mill was verified and the result exceeded by far the contractual values of the flatness and thickness performances. Such outstanding result has been achieved through MINO commitment in the continuous improvement of mechanical design, automation architecture and technological models. Anhui Xinke New Materials Co., Ltd. is located in Wuhu Economic and Technical Development Zone. Anhui Xinke New Materials Co., Ltd. was established in 2000 and is listed on the Shanghai Stock Exchange. The Company, which is considered a “key high-tech enterprise” in Anhui Province, includes a provincial Technology Centre and five production plants. Max. rolling speed 450 m/min. Max. rolling speed 600 m/min. GEMCİLER GÜVEN METAL SAN. TİC A.Ş, a well known producer of copper and copper alloys strip in Turkey, have selected MINO SpA of Italy to modernise their existing Four High Cold Rolling Roughing Mill, installed in their Kahramanmaraş plant. This award involves the extensive revamping of a used cold rolling mill, originally designed for large steel strips, purchased from Germany and installed in GEMCILER facilities some years ago. This Mill is now subject of a major upgrade of the entry and exit configuration, along with the modernisation of the rolling stand. 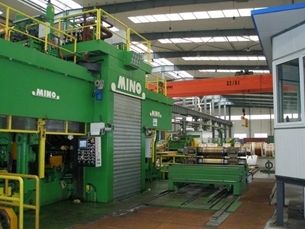 The revamping work by MINO includes extensive mechanical and hydraulic modifications, new electrics and state-of-the-art automation systems, aimed at making the production line suitable to roll high quality copper alloy products, up to an outstanding strip width of 1300 mm, down to a minimum gauge of 0,5 mm. The production rolled on this mill will be able to satisfy the most stringent quality parameters required by today’s market and to feed with top-quality coils the downstream rolling mills for the finishing passes. Installation and on site start-up supervision will also be part of the MINO’s scope of work. For this purpose, MINO has provided a multi disciplined team that has been chosen to work closely with the GEMCILER project management, from project conception to final acceptance. Located in Fano, Marche region, Italy, Profilglass is the fastest growing Italian Company in the Aluminium strip production sector and one of MINO’s best Customers. The association between Profilglass and MINO dates back to 2001 when Profilglass awarded to MINO the first job for the supply of a Cold Reversing Mill. After that first job, MINO was awarded the contracts for the supply of two more Cold Rolling Mills and a state-of-the-art Hot Rolling Line that was successfully commissioned in 2013.
a complete Continuous Tension Levelling, Cleaning & Passivation Line. These two Lines will allow fully continuous operation and will be erected face-to-face in a new bay of the Profilglass plant located in Bellocchi di Fano. 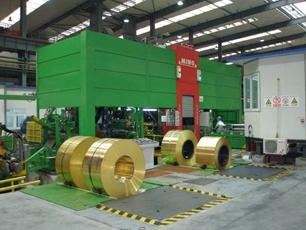 The two Lines will be connected by a coil transfer system and will allow the coils previously rolled in MINO’s Hot & Cold Rolling Mills to undergo a complete heat treatment, tension levelling, pickling and passivation. This new investment by Profilglass is aimed at serving the most highly demanding industrial sectors with top quality aluminium alloy strip of AA2xxx, AA5xxx, AA6xxx and AA7xxx series, including the car industry that requires increasing quantities of aluminium automotive sheet as a lighter weight replacement of steel, both for inner structural parts and for outer panels. More in detail, the Annealing & Heat Treatment Line has been developed in cooperation with Otto Junker Gmbh of Simmerath, Germany, specialist supplier of thermal equipment, to satisfy today’s most demanding industry applications, such as exposed automotive sheet. 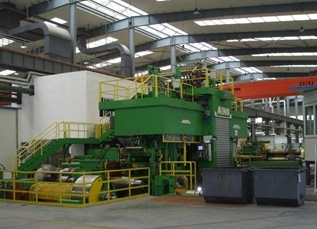 The Annealing & Heat Treatment Line is complete with strip joiner and strip horizontal entry/exit accumulators allowing for fully continuous operation, pre-cleaning & drying section, effective systems to feed the furnace with the strip perfectly centered and having a precisely controlled minimum tension. 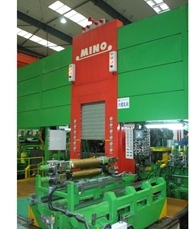 The latter is achieved with a combination of large diameter bridle rolls, strip centering units properly located along the Line and an advanced automation system which benefits from the huge experience gained by MINO Automation in controlling minimum tension in the most demanding applications, such as the foil rolling. The Tension Levelling, Cleaning & Passivation Line is complete with strip joiner, side notcher, entry side trimmer & scrap chopper, strip horizontal accumulator, tension leveller including four levelling cassettes and one anti cross-bow cassette (all of six-high design), alkaline cleaning section, acid etching section, spray-type passivation section, drying section. 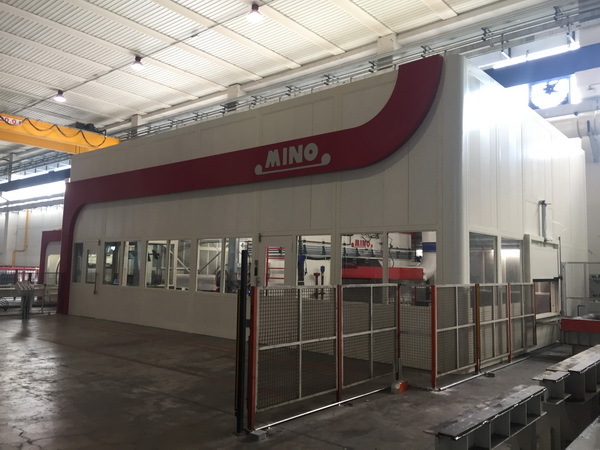 When the two Lines will be in operation, MINO will be one of the few equipment suppliers in the world that can boast of being capable, using exclusively its mills & lines, to take a pre-heated slab of aluminium alloy and transform it into a rolled, heat treated & finished strip, covering all automotive aluminium sheet applications, from inner structure to outer panels! MINO is particularly proud of the consolidated and long-lasting partnership established with this Customer back in 2001 and which has continued uninterrupted through the years, following the spectacular growth of Profilglass in the aluminium strip sector.